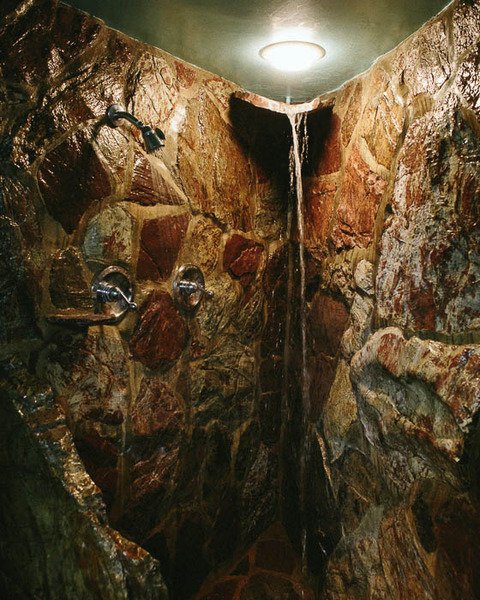 "You can't even fully understand the awesomeness of this hotel until you stay there. 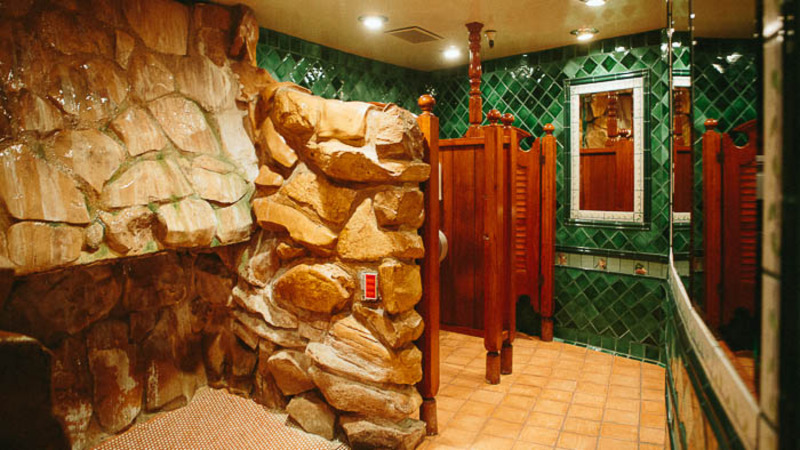 Every room is a balls-to-the-wall, well crafted theme room beyond compare. It's ridiculous and totally hot damn! all at the same time. Instagram heaven." How can you say no to that? Allison G. thoroughly convinced us that we had to go see the Madonna Inn. But wait a second. We travel around with our house. We don't need a hotel room. But I totally need to stay in this room. 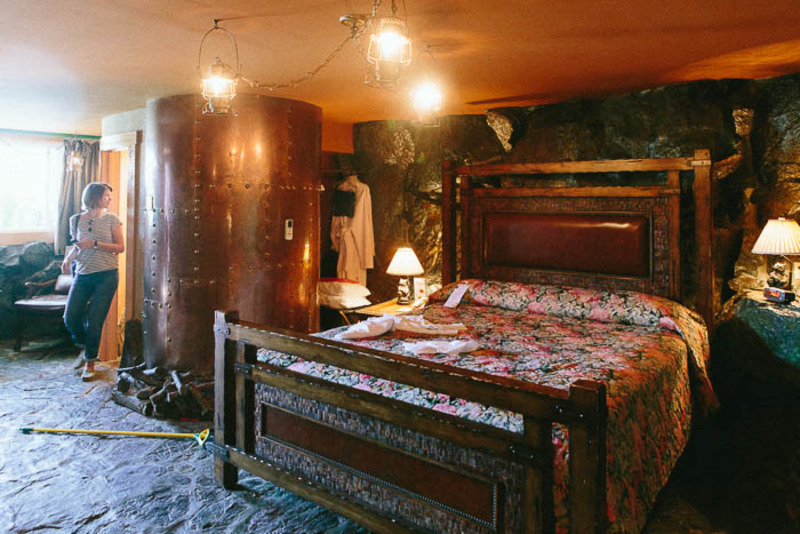 It has an old copper whiskey still built into it. Whiskey not included. So we decided to try and play the blogger card (for the first time ever) and shoot them an email explaining who we were, what our project was and asked if we could come and take a few pictures for our blog. To our surprise, they were completely accommodating. The manager responded quickly and set up a full tour for us. We turned onto the hotel grounds on a Sunday morning, Airstream and all. 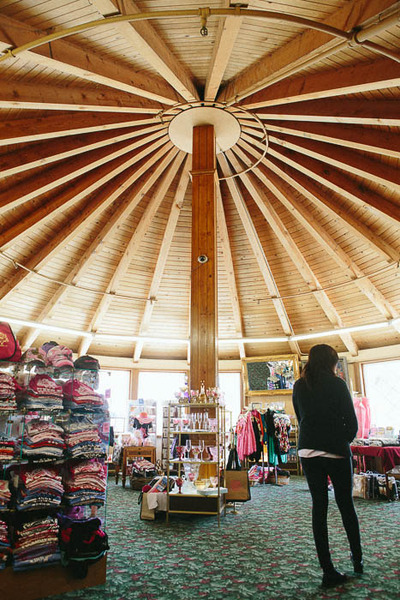 We passed the hot-pink-and-turquoise-floored tennis courts and pulled up to the main building, a curious architectural mix of bubblegum pink Swiss chalet, rustic river-rock Californian with a little Wild West thrown in. We had no idea what we were getting into, but we were giddy with excitement. Emily, our tour guide for the day, came to meet us before leading us through giant, intricately carved wooden doors that open into the main building, which house the Inn's two restaurants, a bakery, a cocktail bar, a dance floor and stage, a boutique and the wine cellar. 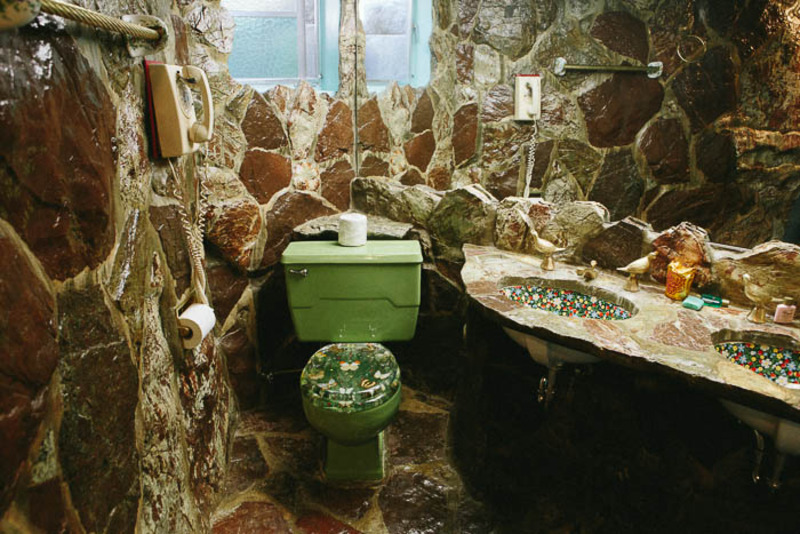 The decor was flamboyant, gaudy and totally over-the-top, but I found it to be endearing and quirky. You can't help but smile. The Gold Rush Steak House was an exceptionally fantastical explosion of hot pink and gold. Liberace would have been proud. 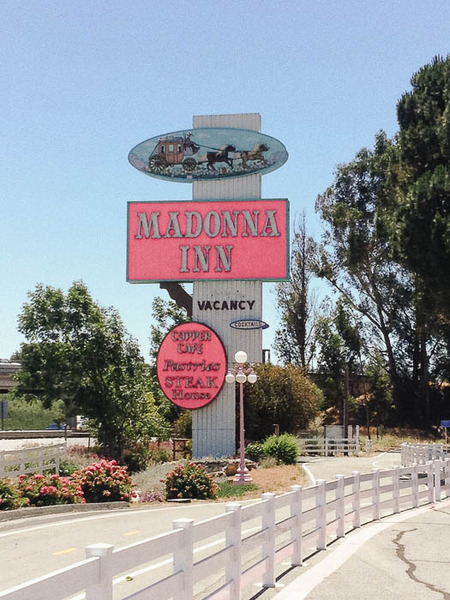 As Emily showed us around, she filled us in on the history of the Madonna Inn. 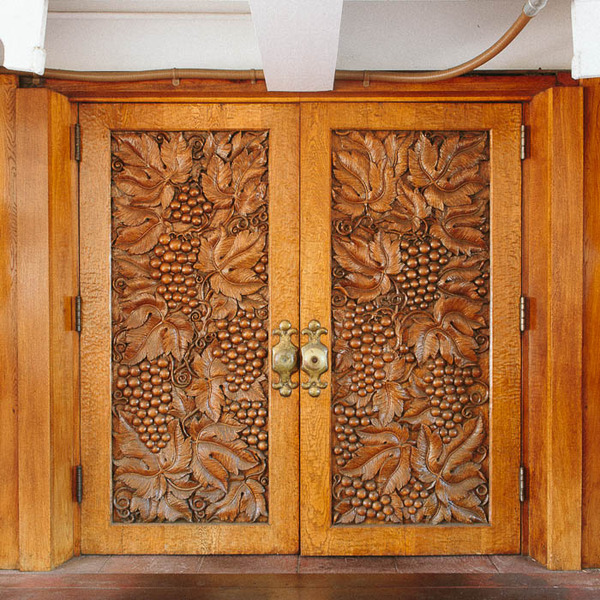 Architect-interior designer/husband-wife team Alex and Phyllis Madonna opened their hotel on Christmas Eve of 1958. The Inn was an immediate success and they quickly expanded to meet the demands of visitors from all over the world. 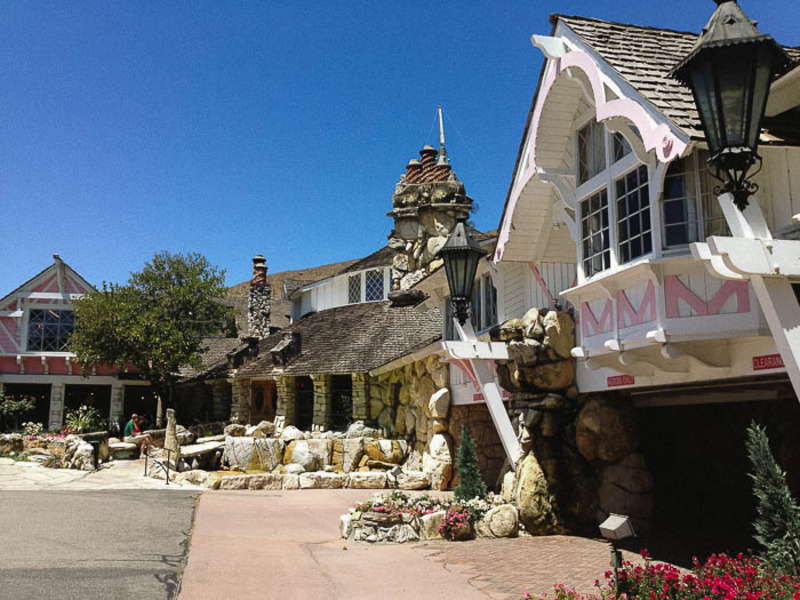 The Madonna Inn has been a staple of the San Luis Obispo area ever since, attracting celebrities and locals alike, but maintains a strong sense of familial closeness. In fact, it's still family owned and operated. 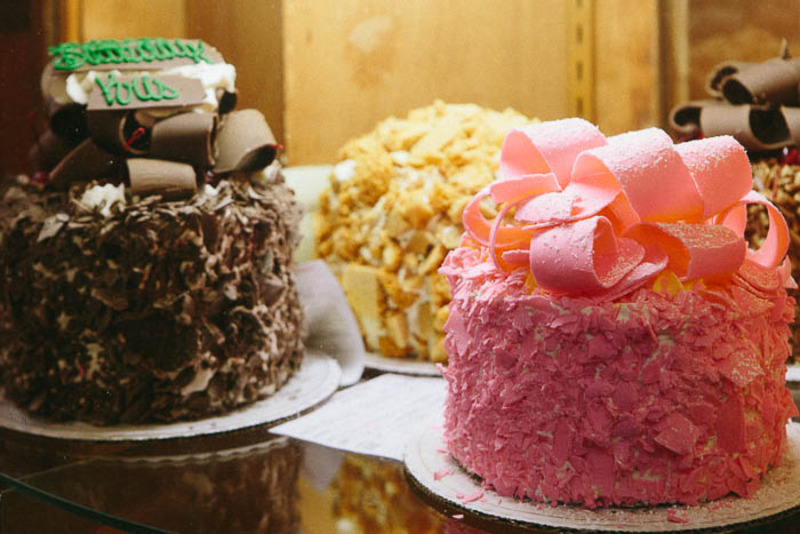 We couldn't help but notice that nearly every room was drowning in pink. Bright, bubblegum, Barbie pink. Emily explained that it was upon Mr. Madonna's insistence that "women look their best in pink". After guiding us through the ornate main building, including letting me peek into the downstairs Men's Restroom, a "must-see" with a giant clamshell sink basin and a waterfall urinal, Emily chauffeured us in a pink (obviously) golf cart to see the rest of the grounds. We golf-carted up the hill to the refreshing-looking pool that overlooks the hotel and the surrounding golden hills. Emily walked us through the state-of-the-art exercise room and the luxurious Day Spa…I wouldn't have minded hanging out there for a while. 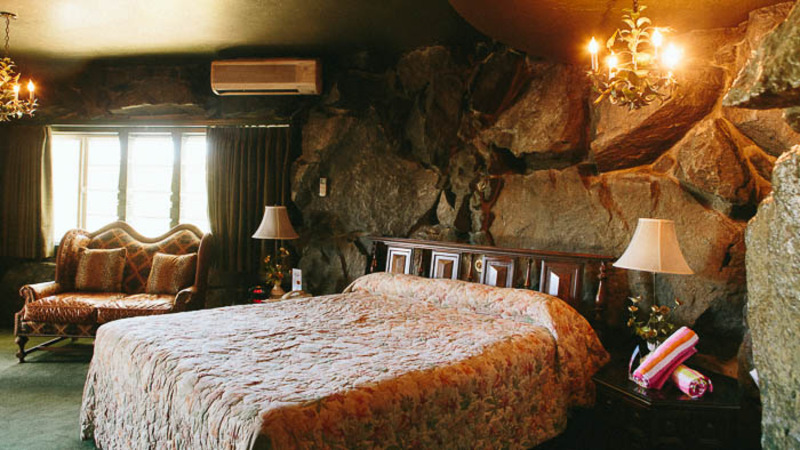 We whizzed over to the 110-room inn, a white trimmed Swiss-chalet style building with a spiraling exterior staircases, that was actually built into the surrounding bedrock. 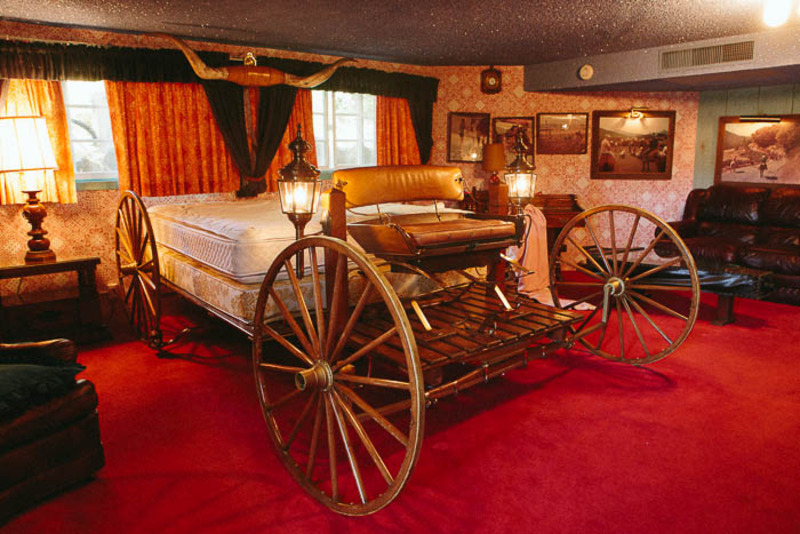 Each room is completely unique and equally eclectic; one room had an old whiskey still built into its walls, one had craggy, exposed rock walls, and Mr. Madonna's room had a bed frame made of an old stagecoach, a rock waterfall shower and a clear toilet seat with butterflies and flowers entombed inside. Very Damien Hurst. The Madonna Family has always been a big ranching family; they still own a huge herd of cattle that roam on their many acres of land and offer trail rides at the Inn. And...they have miniature horses! 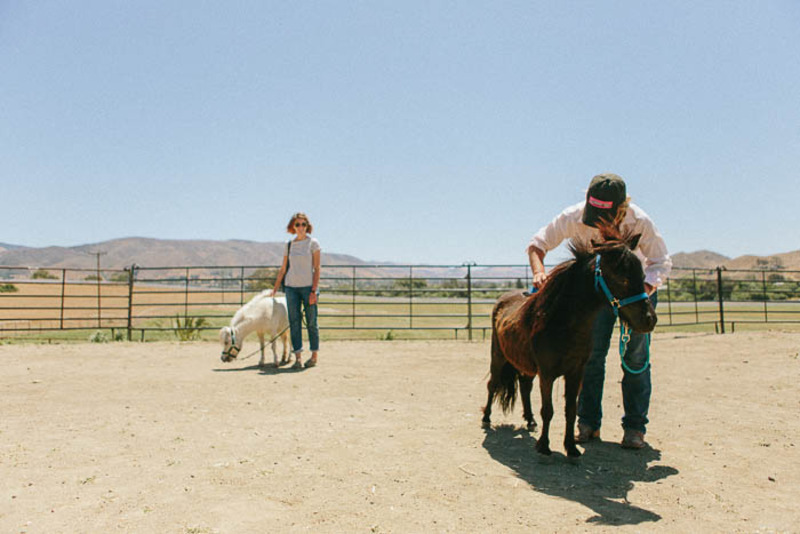 Emily took us to meet the two pint-sized ponies, who acted more like dogs than horses according to their wrangler. We got to lead them around and brush their miniature horse-y manes, practically squealing with delight at these tiny lil' thangs. Our fantastic tour of the Madonna Inn finally came to a close, but not before Emily bestowed upon us a parting gift: a hefty loaf of their Cinnamon Pull-Apart Bread, studded with caramelized pecans! Overjoyed by such a unexpected gesture (and the delicious pastry), Emily got a big hug from the both of us. 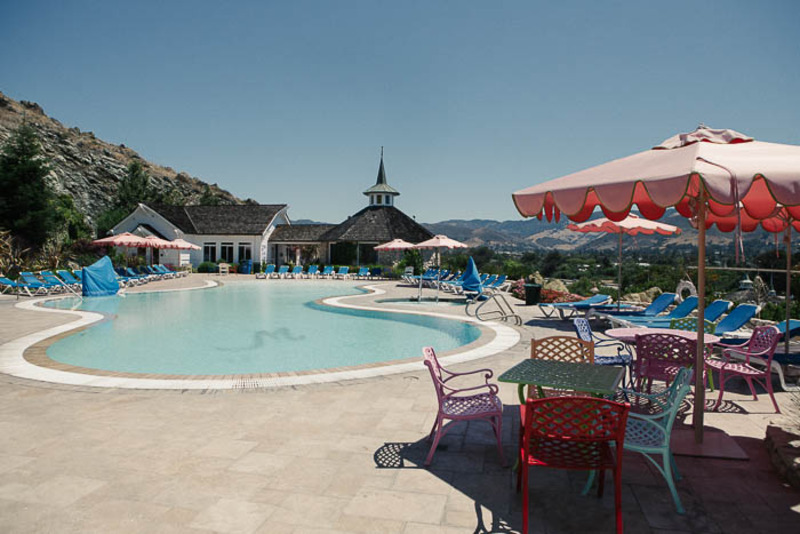 Even though we didn't get to stay the night in one of the Madonna Inn's fabulously over-the-top rooms, we thoroughly enjoyed the short time we got to spend there and will be looking for any excuse to stay there next time we're in San Luis Obispo. Special thanks to allison g. (who suggested Spend the night, bring a bathing suit, eat at the insanely ridiculous restaurant.) for making this blog post possible!